Home › Business › Is This the End of the Commodity Supercycle? These are tough times for commodities. Oil is grabbing all the headlines, with prices plunging 50% since June of last year. But agriculture prices are also soft, especially corn, which is down 53%. Metal prices have been weak for a while, particularly iron ore and copper, which are 40% lower than where they were two years ago. So is this the end of the commodity supercycle? And, what does that mean for business? A commodity supercycle is a period of unusually strong industrial and urban development, where demand for natural resources outstrips supply, sustaining decades of high prices. Think of post World War II or the industrialization of the United States. There is strong evidence that we’ve been riding a commodity supercycle. From the late 1990s to 2008, almost all commodities were experiencing real price growth rates exceeding 10% per year. Oil prices rose 1,062%, copper prices soared by 487% and corn prices were up 240%1. The real price of food increased almost 80% to reach the highest levels in history. Commodity prices crashed during the great recession of 2009 but they recovered quickly and kept on climbing. 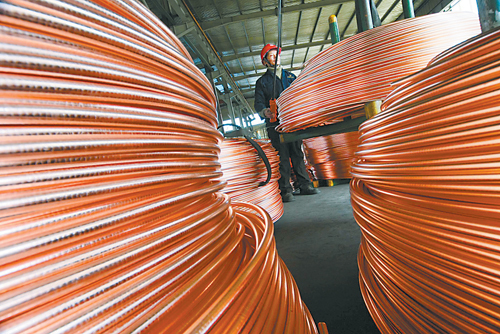 Why the soaring demand for commodities? During this time period, there was an explosion in the size of the middle class. According to the World Bank, the emerging market middle class (people earning between $2 and $13 per day) rose from 894 million in 1992 to 2.06 billion in 2005. It’s an incredible story: more people were lifted out of poverty than at any time in human history. And the first things people want when they join the middle class are pretty simple: better food, a nice home with a refrigerator and maybe even a vehicle. 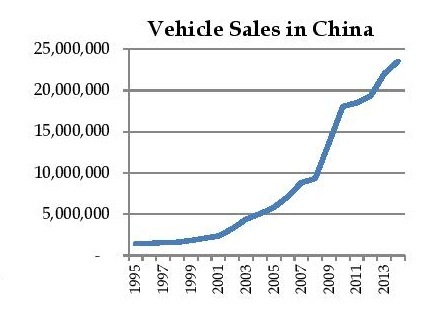 Look at the adjacent graph of car sales in China. Quite amazing, but if we graphed car sales in Indonesia, refrigerators in South Africa or home construction in India, the graphs would all look similar. All this requires enormous natural resources. For decades, producers of energy, metals and agriculture struggled because they could barely keep up with demand. Then in 2013, with record resource production, demand growth suddenly began to slow and commodity prices fell. So is the party over? Emerging markets have slowed, but we have to look at long-term prospects. The IMF is forecasting that emerging Asia will average 6.5% growth through 2020; Latin America and Africa will grow at 3.2% and 6% respectively. The OECD is forecasting that the global middle class will increase from 1.8 billion in 2009 to 3.2 billion in 2020. That’s a lot of new consumers and a lot of commodities needed as people get wealthier. So the commodity supercycle is not over, but when demand depends so much on emerging market strength, we have to anticipate volatility. Prices will recover but not to the lofty heights of 2007. This is good news for Canada because we have some of the most efficient natural resource producers in the world.